The main topic of discussion is first family of what....some of the things I've come across are propaganda, uselessness, nothingness and etc. Cosmopolitan is tripping. 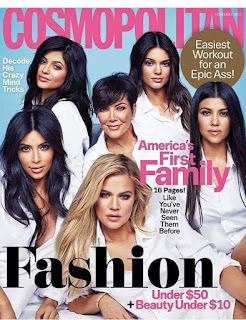 I know their main objective is to sell issues and no doubt they sold a gazillion since the Jenner-Kardasians hasn't graced their cover in four years. But that title needs revamping. Any suggestions?